It’s a Saturday morning and our kitchen is alive. Three toddlers and I are sitting on the floor rolling out puff pastry. 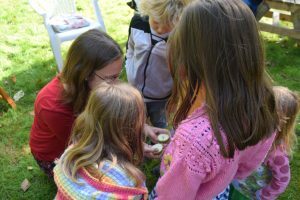 At the kitchen table a group of children and adults are chopping apples. My two year old son and my sister are standing at the kitchen island peeling the apples. In front of me, three other children are painting cardboard fruits. 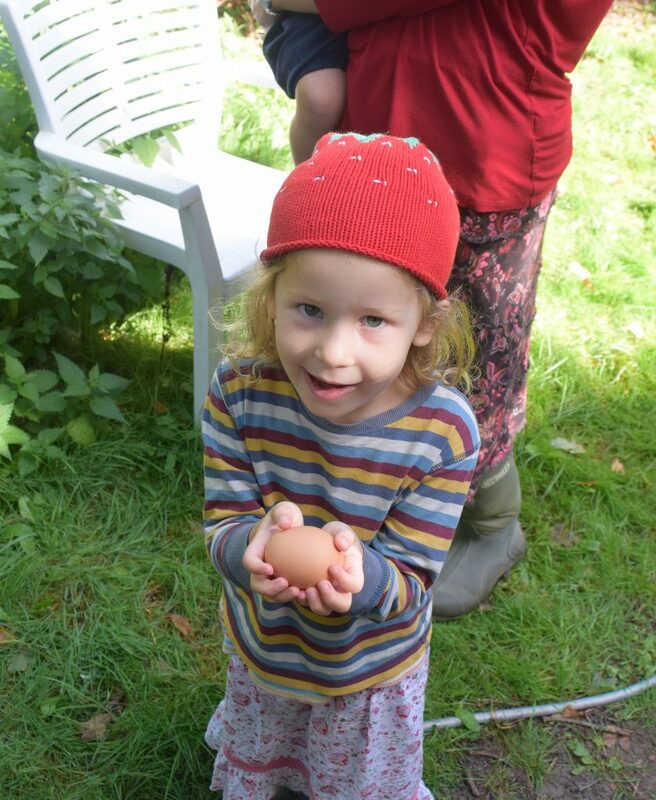 A five year old carries an egg carefully through the doors, extracted from our chicken roost. Outside the house, a circle of chairs and benches surrounds an old copper cauldron, filled with bits of grass, leaves, and decorated stones. I have not begun a nursery school, nor an infant Hogwarts. 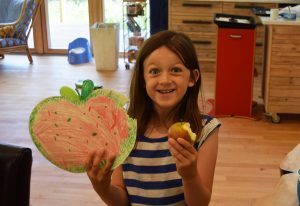 What I am describing is the first ever Giant’s Garden, launched with apple-jubilance on Saturday 15h September 2018. This is a project I have been brewing for awhile but have struggled to write about. 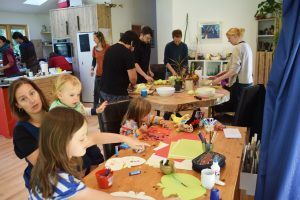 I think this is partly because its concepts are ecophilosophical, and its reality is a kitchen full of sticky toddlers wielding coconut oil, paint sticks, safety knives and pastry brushes. I did not know, when considering the ecophilosophy, whether reality would survive it. In fact, it was that very tension between ecophilosophy and real life with a toddler that began the Giant’s Garden in the first place. My PhD was on stories and ecology, and one of the books that influenced it was Spell of the Sensuous, by traveller and philosopher David Abram. Here, Abram argues for the deeply rooted wildness of language and imagination. In fact, he suggests, it is storytelling in indigenous cultures which often provides the crucial bridge between ourselves and the world, “a mode of discourse that continually weds the human community to the land.” Another book with a profound impact was Jean Liedloff’s The Continuum Concept, in which she describes her experience of parenting and community in the South American jungle. Liedloff writes how, with no word for “work” and no concept of “recreation” as we have it, the Yequana tribe with whom she lived pay full creative attention to their day to day tasks, and everyone is invited to participate. For small ones, this mostly involves wandering in, having a go at chopping a vegetable and wandering off again. But the invitation is there. And, as Abram talks about, imagination weds us to the world in which we are. One of the things I have found hardest about being a mother is that there are so few community spaces where my son and I can work with the world together. Home-making, i.e. management of the wild-civilized intersection that allows us to exist at all, is not where community is held and stories are told. Rather, home-making is the frantic thing we try to do on top of everything else that needs to be done. My son is two. He wants to do. The things that most delight him involve helping me or his father or grandma handle the fireworks of reality, watering the plants, chopping the potatoes, picking and eating the raspberries on the bush. But I don’t often have time, space, or resources enough to engage him with my work. Today, we try and keep our lives going smoothly and we try and teach our children the wonder of the world. We are no longer held within a community of interactions in which it is possible for the two to become one and the same. Our children are taught from the beginning that good time is occasional, and antithetical to the rhythms that keep us alive. So in this one-to-two-year-old year of his exploring, tasting and testing out the world, my son and I have moved from soft play centre to dance class, playground to library, from toys to books to painting to teddy bear tea parties, and a weird voice inside me keeps saying where’s the work? The Giant’s Garden project is running in our garden, but it’s not our garden, despite the fact that Arun keeps saying to me in excitement: “Our garden is the giant ’s garden!” It’s not a place, because we don’t live any longer in those places where stories are told with the bear, the squirrel and the otter, and community is strong enough to have collective homes. 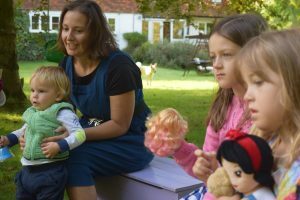 Instead, the Giant’s Garden is an experimental method that we have begun teaching small people (and big people) about the interaction between imagination and attention. 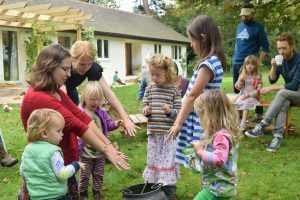 At the start of every session we gather around that old copper cauldron and wiggle our fingers and stamp our feet in order to open a door to a different world. Not a world that isn’t here. Rather a world where magic, children, play and work are invited to exist together. And, hopefully, the space that is-isn’t of the Giant’s Garden will wriggle its own fingers and stamp its own feet and begin to spread across public places and garden spaces of the county. The Giant’s Garden team consists of me, my husband (a therapist trained in outdoor education) and Arun (an expert in dragons and wonder-magic). 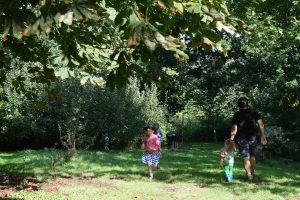 Joining us is the fantastic Lucinda Warner, a herbalist and forager who, in the second Giant’s Garden session took us on a quest for hawthorns and taught us how to make hawthorn fruit leather. Next session (which I am very excited about) she is going to teach us how to make himalayan balsam and nettle seed pancakes with rosehip syrup. The project is running under the auspices of HKD Transition, the Hassocks, Hurst, Keymer and Ditchling branch of the Transition Towns movement, which seems appropriate given that the movement is about building stronger communities to respond to climate change, and the Giant’s Garden is about transitioning ourselves into, rather than out of, the world in which we live. On Saturday morning, when stories had been told, apples picked, and all apple puffs devoured with great satisfaction, I gathered up my tired son, and began a conversation with Lucinda about berries. We were discussing whether the rosehips were ready – earlier than they normally would be – and Arun joined in. “The rose hips are still green,” he said, seriously and excitedly. “They’re growing red but they are some of them still green and growing to be red.” “I agree,” said Lucinda. “I think they probably need a week or two more.” We all wandered off to have an inspection of the rose bush underneath the Scots Pine tree. Something about this encounter made me deeply happy. While Arun is full of words, when he joins conversations he normally does so with two year old non-sequitars about his day, his emotions, or experiences he wants us to recall, “remember when we went on an aeroplane!” when we are in the middle of talking about stew ingredients, for example. I think this was the first time he had joined in a conversation for the conversation. And perhaps it was because he felt as if he had been invited.